The biggest victory for taxpayers during the Obama years was the Budget Control Act in 2011, which imposed sequester-enforced caps on discretionary spending. Indeed, that legislation was then followed by a sequester in early 2013, which was a stinging defeat for Obama (he tried to forestall the sequester with hysterical predictions of doom). But politicians don’t like fiscal restraint. Spending caps limit their ability to buy votes with other people’s money. So they evaded the spending caps in late 2013. Then they did the same thing in late 2015. And now it’s happened again. The budget caps have been busted again as part of a new agreement. To be blunt, the swamp has triumphed over taxpayers. The politicians who promised to clean up the mess in Washington have decided that the cesspool is actually a hot tub. Most critics of the deal are focusing on how it means more red ink. But that’s a secondary problem. The real mistake is that government is getting bigger, and that means private sector activity is being displaced. Here’s everything you need to know about what’s happening to overall discretionary spending, captured in a chart from the Committee for a Responsible Federal Budget. The blue bars in the above chart show what happened in the real world (technically, they show annual “budget authority,” which is sort of like the money that gets deposited in a checking account and “outlays” are when checks are written). The green line shows the spending-on-autopilot forecast from early 2011. The red line shows the discretionary spending allowed by the Budget Control Act. And the yellow line shows what spending should have been if the sequester was left unchanged. The bottom line is that the spending levels for 2018 and 2019 mean that the victory of the Budget Control Act has been almost entirely undone. 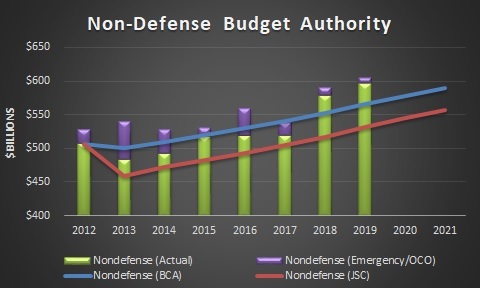 Now let’s look at the numbers for non-defense discretionary spending, based on data from the Congressional Research Service and the Office of Management and Budget. Once again, we see the same pattern of good promises and bad results. And this happened with Republicans in partial control or (now) complete control of the process. Needless to say, I tried to convince GOPers to do the right thing. But I failed. Republicans claim, for what it’s worth, that the deal was necessary to get higher defense spending. I question that goal (we already spend enormous amounts of money compared to any potential adversaries, and I also think we shouldn’t squander blood and treasure on overseas nation building). But even if one believes in more defense spending, why add huge increases in domestic spending? Why not copy Franklin Roosevelt and Harry Truman, both of whom reduced the burden of domestic spending when increasing defense outlays? My pro-GOP friends in Washington respond by stating that Republicans didn’t have 60 votes to overcome a filibuster in the Senate. That’s a legitimate point, but I respond by asking why they didn’t force Democrats to conduct a real filibuster (hold the floor for 24 hours a day, 7 days a week)? They then tell me that a filibuster (assuming Democrats didn’t get tired of holding the floor) would mean stalemate and eventually could result in a shutdown. Another fair point, but I then point out that left-wing constituencies are the ones that will feel the pinch if non-essential parts of the government cease operating. At this point, the truth usually comes out and they tell me that Republican leaders can’t play hardball because too many of their members actually like big government. By the way, I put a greater share of the blame on the Trump Administration. If the White House drew a line in the sand and told Congress it would block any spending above the caps, lawmakers would have been forced to prioritize. 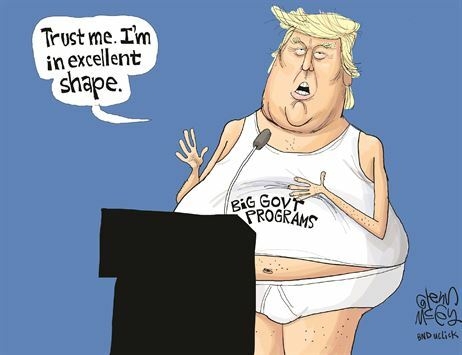 But since Trump doesn’t seem to have any interest in fiscal restraint, we’re getting a repeat of the profligate Bush years – with congressional Republicans figuring they may as well take part in the feeding frenzy. I’ll close by noting that this isn’t the end of the world. Yes, we have far too much discretionary spending, and the additional spending in this agreement is bad news. That being said, the extra outlays are relatively trivial compared to the gigantic problem of ever-expanding entitlement spending. But the fact that Republicans aren’t willing to enforce any discipline on discretionary outlays certainly does not bode well for the presumably more-difficult battle for genuine entitlement reform. P.S. I’ll make a prediction right now (and I’ll even make a wager with any interested parties) that inflation-adjusted domestic spending will climb faster under Trump than it did under Obama. Great piece Dan. Totally agree with you, it is truly a victory of the swamp over the American taxpayer. I worry about the trillion dollar deficits that are on the way, politicians in D.C. refuse to acknowledge that you can print money to generate prosperity. I disagree with you on Defense for a couple of reasons. Fiscal policy aside, defense is one of the few powers actually enumerated to the federal government in the Constitution. Most of the other things that the federal government does aren’t constitutionally compliant. While we’ve been playing “build a country” in the Middle East and Afghanistan, our adversaries have been spending to modernize their militaries and expand their capabilities to counter our strategic and tactical advantages. It is time to play catch up unfortunately. I think there can be a lot of savings in the DoD from forcing or effectively persuading allies (especially NATO) to spend more on their own defense, spending less on nation building, privatizing the VA, streamlining service members benefits and compensation into a flat payment, and trying seriously to prioritize R&D, modernization, and training over other non-essential priorities.